BRANCH, Lawrence O'Bryan (1820-1862) Confederate general from North Carolina, who as a member of A.P. Hill's "Light" Division, was killed at Antietam, September 17, 1862. 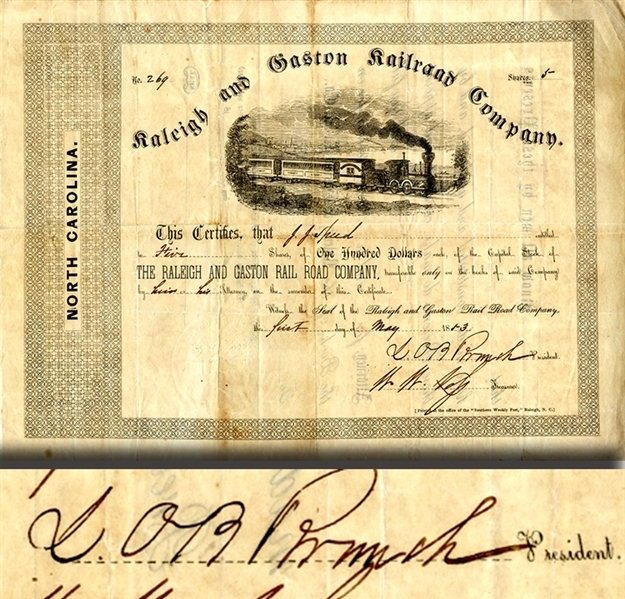 Stock certificate for the Raleigh and Gaston Railroad Company, 8" x 10 1/2", "L. OB Branch" one page with docketing, May 1, 1853, Raleigh, North Carolina. Incorporated in 1835, the Raleigh and Gaston R.R. was one of the earliest such ventures in the United States. It was to play an important role during the Civil War as it moved men and supplies east to the Weldon Railroad, which went on to Petersburg, Virginia. The Raleigh and Gaston lost its singular identity in 1900 when it merged with the Seaboard Railroad. This certificate is illustrated with a splendid engraving of a very early locomotive and is made out to W.D. Jones for nine $100 shares. VG.